Chunks of chicken deep fried crispy sauteed in a special Hunan sauce on bed of broccoli. Chunks of chicken deep fried crispy in chef special sauce surrounded w. broccoli. Chicken & Shrimp w.mixed vegetables. 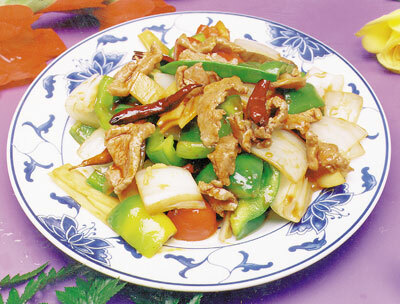 A splendid combination of beef, chicken and shrimp delicately balanoed with a variety of fresh veg. in our special sauce. Chicken & jumbo shrimp w. Chinese vegetables in chili sauce. Tender filets of marinated beef delicately sauteed & seasoned w. orange flavor. Tender filets of marinated chicken delicately sauteed & seasoned w. orange flavor. Two separate dishes. Jumbo shrimp w. Chinese vegetables & GeneralTos's chicken balance on the other box. Jumbo shrimp, chicken, beef, pork, sauteed w. Chinese vegetables, corn, mushroom, snow pea & red pepper. Shrimp & scallop sauteed w. mushroom & broccoli in chef's special sauce. BEEF & SCALLOP, HUNAN STYLE. Beef & scallop sauteed w. mushroom & broccoli in chef's special sauce. Jumbo shrimp, chicken, beef, pork, crab meat sauteed w. broccoli, Chinese vegetables, corn, fresh mushroom & snow pea. Deep fried noodles w. shrimp, scallop & vegetables in white sauce. Scallop, jumbo shrimp, crab meat, sauteed w. assorted Chinese vegetables. A delicious combination of chicken, beef, shrimp, roast pork & mixed veg. in brown sauce & surrounded with 7 jumbo shrimps. Crispy duck w. jumbo shrimp, chicken, roast pork & vegetables.